Everywhere on the media we get news about the financial crisis and recession. It’s not a single country problem but most of the developed world is in a recession now. The situation has also been called “The Great Recession”. Some people are also using the term ‘depression’ but that is not what economists would use, not yet. What then is the difference between a recession and a depression? 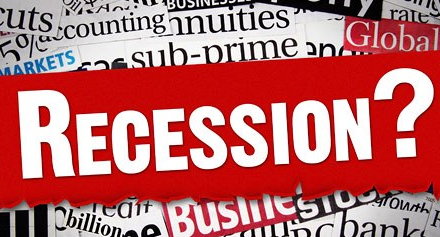 Dictionary.com defines recession as “a period of an economic contraction, sometimes limited in scope or duration.” Economists usually define a depression as a decline in real GDP of more than 10% over three or four years. A very old joke tells us “a recession is when your neighbour loses his job, a depression is when you lose yours”. Production decreases – People buy less and companies produce less because they can’t sell. Stocks fall – As companies make less profits confidence in the company’s ability to grow and make profits comes down. This lowers share prices. Politicians and company directors start denying – Any early signs of recession are promptly denied as usual market fluctuations or blamed on previous government policies. More people are unemployed – Companies earn less and cut costs by firing people. Labour is usually the largest expense of a company and thus the greatest savings comes from cutting labour costs. People start spending less – People are scared of losing their jobs or incomes and start saving so that they can live off savings if they lose their incomes. Interest rates fall – Governments and Central Banks lower interest rates to make money cheaper so that it is easier for companies to borrow and increase their productivity. Governments adopt expansionary policies – Taxes are cut and public sector spending is raised to boost confidence and increase spending power of consumers. Confidence in the financial institutions suffers – Governments put astronomical sums of taxpayer money to save financial institutions like banks and pension funds to maintain confidence in the financial system. Gloom mongers are in full swing – The same politicians and directors who denied early signs of recession start competing to paint blacker than black pictures of the state of the economy so that taxpayer money can be used to bail out ailing companies or industries and politicians would be seen as saviours. Stricter laws about financial instruments – Governments or central authorities try to introduce stricter methods of controlling financial instruments and systems. Some high profile scapegoats are found. After some time innovative operators succeed in going around control mechanisms resulting in new misuses. Many companies go bankrupt – Companies, which are not agile enough to react to the crisis or able to pressure the governments into bailing them out go bankrupt. Usually the taxpayer is left with the costs of the bankruptcies. Care industry grows – Demand for services grow due to unemployment, early retirement, health problems and mental health issues. Cosmetic industry booms – People defer making large purchases like homes, cars and foreign vacations but buy relatively lower cost cosmetic products to feel good quickly. Reading, communal activities and spending time with family and friends increases – With less money being spent on entertainment, hobbies, travel and devices, activities, which require less money become more popular. Less babies are born in affluent countries – Measured by lower number of searches for baby related products, Heather Hopkins of Hitwise claims that less babies are being made now due to the recession. Developing economies suffer more – If developing economies have to borrow to invest in new kinds of production, their debt burden increases. The developing world already spends $13 on debt repayment for every $1 it receives in grants.